A little-known fact about Bi-2 – one of Russia’s most famous rock bands – is that its members, Shura and Leva, spent years living in Australia before they hit the music charts on home territory in Russia’s chaotic late ’90s. After the collapse of the USSR in 1991, the then-young musicians moved from Belarus to Israel. Then, in 1993, Shura moved to Melbourne, and Leva followed, although not until 1998. 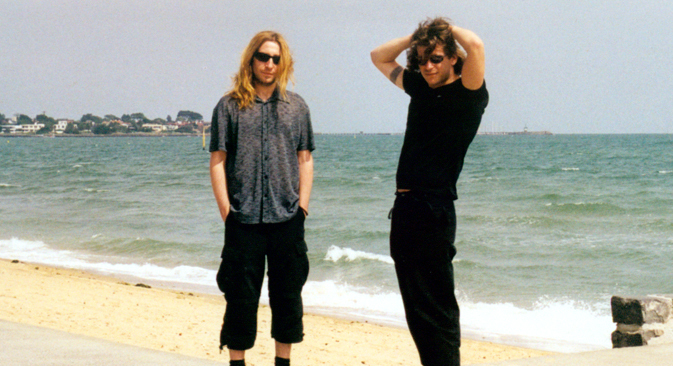 Over 1998 and 1999, the two recorded an album called And The Ship Sails On. It wasn’t released in Russia in full, but a few tracks made their way back home and were played on Russia’s top rock stations, including Nashe Radio and Radio Maximum; and it was the popularity of these tracks which drew them back to Russia. In 1999, the two went to Moscow, planning to stay no more than two months – but it was two years before they next returned to Melbourne. After their single No One Writes to the Colonel made the soundtrack of the blockbuster cult film Brat 2, they were suddenly famous. Since then, the pair have won 12 music awards, including the World Music Award in 2001, for higher sales than any other music group in Russia. Their tracks went on to appear in 20 more films and they recorded eight albums. The duo say that Australia had an important influence in helping them make commercially successful music. In the late ’90s they were strikingly better in quality terms than other bands already on the Russian market. This was due to Australian sound-recording quality and the fact Western influences helped this group to be at the forefront of a new genre in Russia, which was somewhere between rock and pop. Leva: There’s nothing rosy about emigration. We were leaving for a desert [Australia] not knowing what awaited us. Shura: I was 21 at the time. Leva: And I was 19. We were very young. But grown-up [emigrés], who had worked as doctors, musicians and engineers back in Russia, had it even harder than us. Did you really work washing dishes when you first arrived in Australia? Shura: How else do you think we earned the money to record? I washed dishes and worked as a kitchen hand; Leva painted walls. This is how we saved up for our first album And The Ship Sails On [which was released by Sony in 2000]. We have no regrets, though. For example, it was in Australia that we really learned what sound recording was about. I arrived there ahead of Leva, and played with a succession of different cover bands and a Gothic band called Chiron. Then, just two weeks after Leva arrived from Israel, I took him to our studio. This was his first time in a professional studio, and he was immediately asked to do a guitar solo. Of course, he was overwhelmed. Is recording in Australia really so different from Russia? Shura: It’s somewhat similar to how they do it now, but it had nothing in common with how it was done [in Russia] in the ’90s. Back then, there wasn’t a single Russian studio that would have come close to the standards of Australian sound recording. We’ve now got a large and pretty decent studio in Moscow and we record everything there. But we still do our mixing in Australia or the UK. We have an Australian sound engineer (Adam) who does a lot of mixing. Following Western conventions, vocals are usually set at the same level as instrumentals – like, at the same level of the bass drum. I keep asking Adam to make our vocals louder, but he reckons they’re already too loud. But it’s important for Russian audiences to hear the lyrics. So we squabble our way through each new album. I speak better English than Leva, so Adam’s not afraid of me; he is afraid of Leva. Leva will say something to me in Russian, and Adam will ask me to interpret, and I’ll go: “He’s not happy with your work because we can’t hear the vocals. If you don’t bring them up, he’ll bring some friends round to your place and have a man-to-man chat …” Sometimes this works, sometimes it doesn’t. Adam told us we were one of the most successful bands he’d ever worked with. You’ve lived in Russia for 13 years now. Do you ever miss Australia? Leva: We go there regularly because it’s where our music is mixed. We usually fly over in early January, right after New Year’s and stay a couple of months, while Russia’s having its hardest winter months. Australia is warm and comfortable, and we have a lot of friends there. It’s also a really safe place, with virtually zero crime. You didn’t have any success breaking through in Australia? Originally published in March 2014 in the Russia Beyond the Headlines supplement to The Age and The Sydney Morning Herald newspapers in Australia.